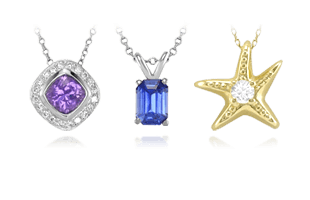 Princess Diana will always hold a very special place in the world of sapphires and the revolution she started with modern sapphire engagement rings. 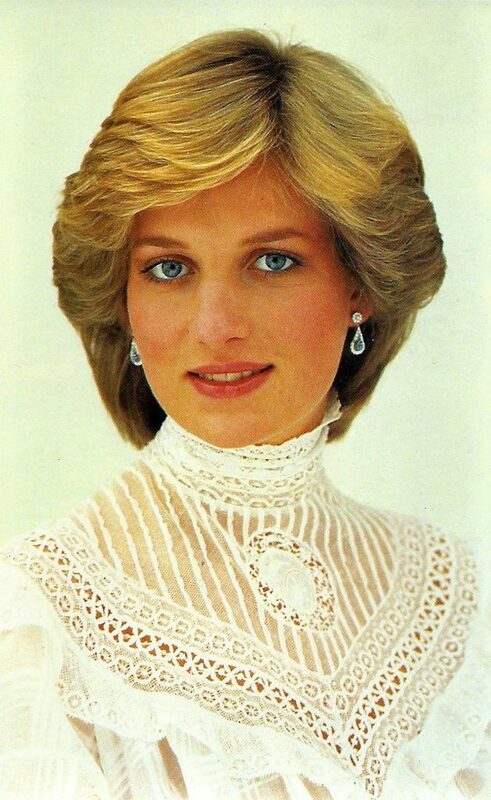 A portrait of Princess Diana. 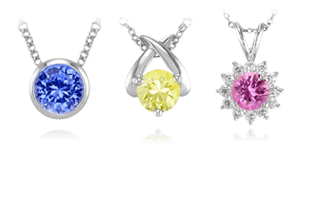 Since roughly the 14th century, sapphire engagement rings have been favored amongst royal and wealthy families as the stone was believed to symbolize romantic love, truth, and commitment. The sapphire has also always been seen as so much more rare than diamonds, the usual engagement ring stone, that is held an appeal amongst royals for a very long time, building on legacies of beautiful blue sapphire gemstone rings. 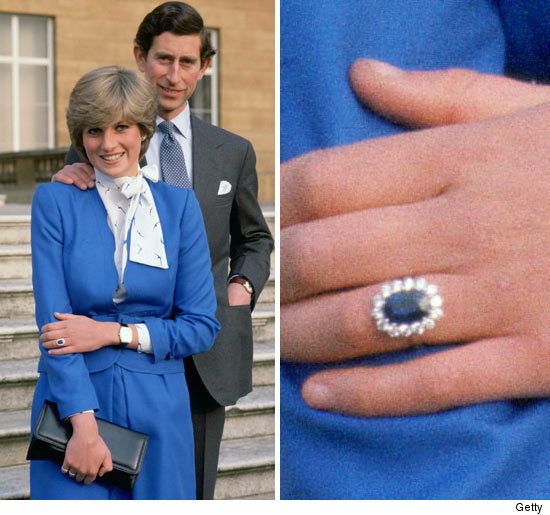 There is possibly no more famous sapphire engagement ring in the world than the oval blue Ceylon sapphire and diamond ring that Princess Diana accepted upon her engagement to Prince Charles. A young Diana in the garden at her home in Althorp. 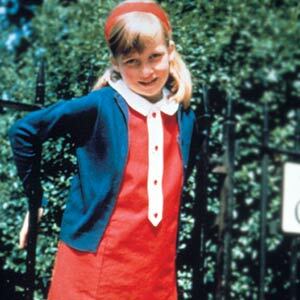 Diana Frances Spencer was born July 1, 1961 to parents Frances and Johnnie Spencer. When her parents divorced in 1969, her father was given custody of Diana and her four siblings. In 1975, when her father became the eighth Earl Spencer, Diana was elevated to the role of Lady as the eldest female in the household. Two years after that, Diana moved to a South Kensington apartment where she shared the space with three roommates. Diana began her work with children at that point, working as a nanny and teaching assistant at the Young England Kindergarten. In July 1980, Diana attended a weekend party at the home of Philip de Pass. The Prince was among the guests, and he and Diana talked at length for the first time. Apparently the Prince was touched when Diana inquired how he was holding up after the loss of his godfather, Lord Louis Mountbatten, whom had been assassinated nine months earlier. Charles and Diana had several dates over the next several months. They attended a concert at the Royal Albert Hall one Sunday evening, and following that, the Prince invited her to join him on the royal yacht, Britannia, for the August regatta, as well as to Balmoral in Scotland for the Braemar Games. Lady Diana Spencer and Prince Charles on the announcement of their engagement. What followed these events was a seemingly very quick road to an engagement. As the couple revealed, on February 4, 1981, Charles and Diana had an intimate dinner in his apartment at Buckingham Palace. Later that evening in the castle’s nursery where he played as a child, Charles proposed to Diana with a ring she herself chose: an oval 12 carat Ceylon blue sapphire framed by 14 round diamonds. The blue sapphire was Diana’s favorite gemstone, and she was known to wear a lot of blue to complement her blue eyes. Princess Diana wearing sapphire earrings and a necklace. A short twenty days later, Charles and Diana announced their engagement to a world eagerly awaiting the news. Roughly five months later, on July 29, the couple was married at St. Paul’s Cathedral in a wedding that cost an estimated $48 million and was watched by around 750 million people around the world. Almost a year later, on June 21, the couple’s first son, Prince William, was born. Diana had a difficult pregnancy with crushing morning sickness, but the couple was elated with the arrival of their son and seemed to settle into a blissful few years. Diana emerged as a fashion icon whose grace and personal appeal constantly outshined that of her husband at public events. She was also a clotheshorse, spending an estimated $2,500 per week based on some reports during the first year of her marriage. 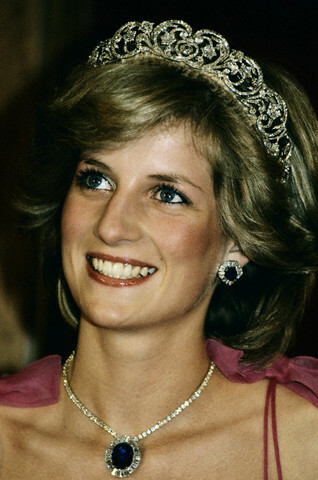 Women began to style their hair like Diana and mimic her choice of clothing and jewels, especially her royal blue sapphire engagement ring. Princess Diana wearing the famous sapphire and pearl choker, the sapphire of which she received from Queen Elizabeth as a gift. A contestant at the 1984 Miss World Beauty pageant famously remarked that Diana was “the one we all want to look like. The Princess of Wales is number one.” Diana also convinced Prince Charles to update his image, suggesting he let his hair grow just a bit longer and wear brighter ties and less somber suits. These were all vast improvements to Charles’s look, and immensely helped to improve feelings towards the royal. On September 15, 1984, the couple welcomed their second son, Prince Harry, and Diana entered a phase where she flourished as a mother and seemed to finally find a confidence in herself. 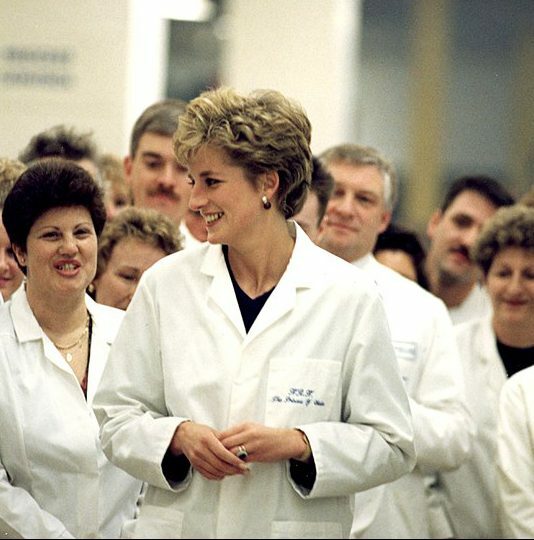 Princess Diana visiting a factory in Surrey Shields, 1992. Diana was dubbed the “People’s Princess” due to her warmth and tireless work for a variety of charities. She represented the International Red Cross and was praised for her support of battered women and the homeless. Among other causes, she was also the voice for victims of AIDS and landmines. As Diana found more of a place for herself in the world, she and Prince Charles were growing apart and they separated in late 1992. The public did not understand the full extent of the unhappiness she had experienced in her marriage until three years later when she gave a candid interview to Martin Bashir on British television. By the following year, the divorce of Charles and Diana became final. Princess Diana dancing with John Travolta at a White House State Dinner. Delving deeper into her philanthropic and humanitarian work, in June of 1997 Diana chose to auction pieces of her personal dress collection at Christie’s in New York. 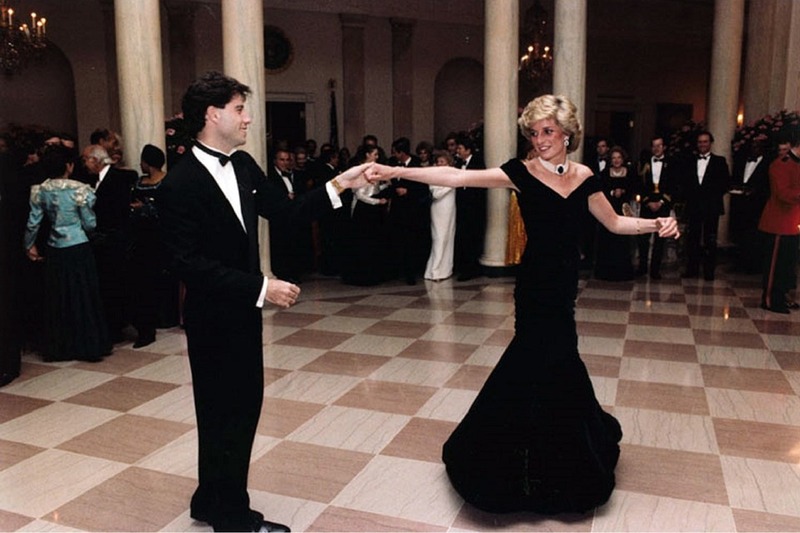 One of the highlights of the event was the sale of the velvet dress Diana wore the night she danced with John Travolta at a White House State Dinner. The gown reportedly sold for $222,500, and the event raised $3.26 million for a variety of charities. 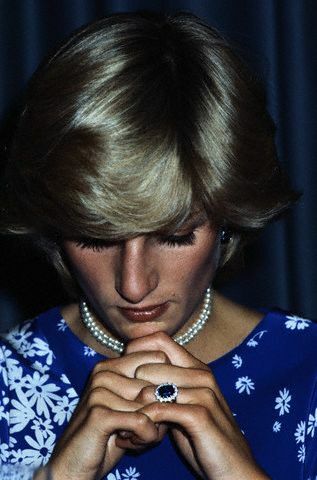 Diana, Princess of Wales, wearing her famous sapphire engagement ring. After only a year of being officially divorced, Diana had seemed to be excited about beginning a new chapter with another man and they were making plans for their life together. Diana and Egyptian businessman Dodi Al-Fayed spent the summer together on his yacht, with Princes William and Harry, before traveling to Paris. Tragically, Diana and Dodi Al-Fayed would lose their lives in Paris in a harrowing car ride, fleeing members of the paparazzi on August 31, 1997. It is still unclear exactly how the crash happened inside the Pont d’Alma Tunnel, but Diana would die only hours after the crash, unable to recover from the damage inflicted. Princess Diana, the “People’s Princess” in New York City. Immediately after her death, an estimated $1 billion in donations poured into the Diana, Princess of Wales, Memorial Fund, which services her favorite charities. Diana’s legacy also continues through her sons, Princes William and Harry, as they continue her humanitarian reach and work to continue rebuilding royalty with the personal touch that was quintessentially their mother. The beautiful 12 carat Ceylon blue sapphire engagement ring made a sentimental reappearance when Prince William used the ring to propose to Kate Middleton in November 2010. It has been the centerpiece of their wedding and the standout accessory at many special events. Kate Middleton wearing the sapphire and diamond engagement ring chosen by Princess Diana. 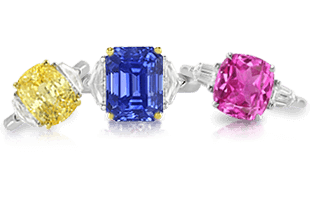 The Princess Diana and Kate Middleton sapphire engagement ring is one in a long line of royal sapphire engagement rings. The love affair with the stone runs deep. When Queen Elizabeth’s father, Prince Albert, proposed to his love Elizabeth for the third time, finally gaining her agreement to marry, they chose a platinum engagement ring set with a Kashmir sapphire and flanked by two diamonds on either side. This would seem to be the beginning of a lifelong love affair of sapphires for Albert, adopting the moniker George VI upon coronation. 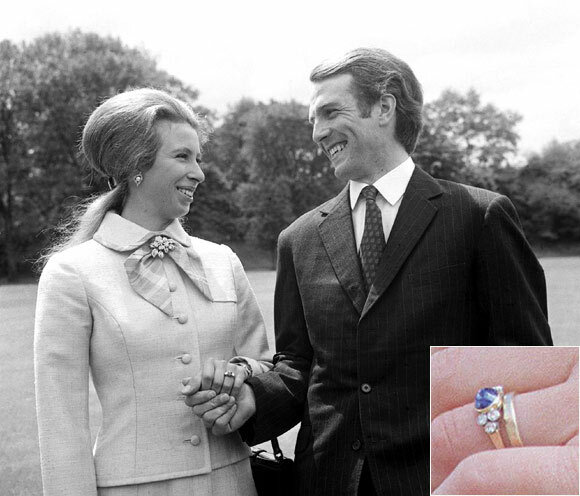 Princess Anne with her blue sapphire engagement ring. Queen Elizabeth’s own daughter, Princess Anne, also selected a sapphire engagement ring upon her betrothal. The ring features a sapphire mounted in bezel setting with 6 round diamonds, 3 on either side. Set in gold, Princess Anne was continuing a family tradition of a strong love of sapphires. 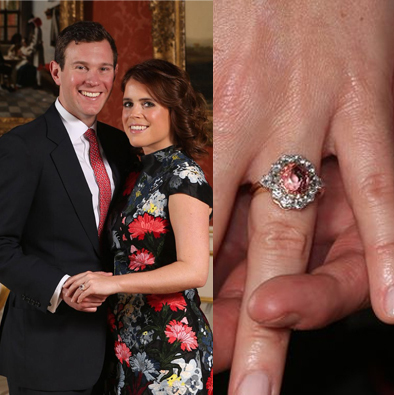 Princess Eugenie and fiance Jack Brooksbank displaying her padparadscha sapphire engagement ring. Most recently, the Queen’s granddaughter Princess Eugenie, announced her engagement to longtime boyfriend Jack Brooksbank. With a twist on the sapphire engagement ring route, Eugenie chose a beautiful padparadscha sapphire as the centerpiece of the ring, surrounded by diamonds in a design reminiscent of her mother’s ruby and diamond ring, as well as Diana’s blue sapphire ring. 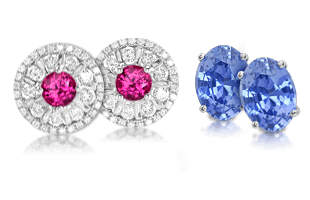 After this extensive review of famous sapphires throughout the world, we next move into some helpful information in Sapphire Glossary | Definitions of Sapphire Terminology.